A masked Somali pirate stands near a Taiwanese fishing vessel that washed up in 2012 after the pirates were paid a ransom and released the crew. The image appears on the cover of Michael Scott Moore's new book The Desert and the Sea. 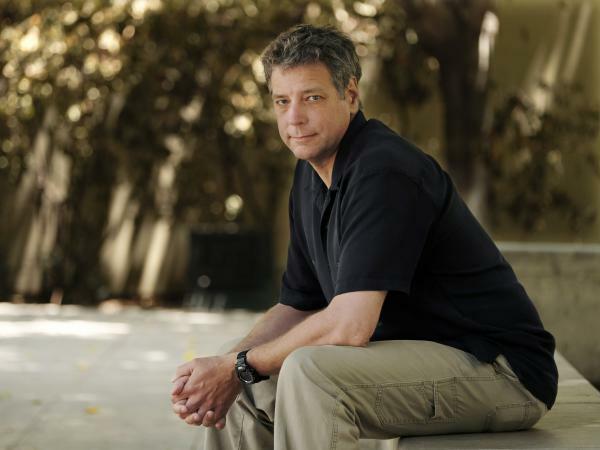 Michael Scott Moore, pictured in Los Angeles in June 2018, has released a book about his abduction and captivity, 6 1/2 years after his ordeal began. "The 12-or-so gunmen on the back came off the flatbed and around to my side of the car and pulled me out," he says. "They bloodied me, they broke my glasses, they broke my wrist, and they piled me into another waiting SUV and drove me off to the Somali bush." That was the beginning of an imprisonment that spanned two years and eight months. Moore was kept in huts, and on a hijacked tuna fishing boat full of other hostages. He got to know his captors. He made friends with fellow prisoners. And he kept turning over one line in his head — something a pirate said in the earliest days of his captivity.
" 'You have made a mistake,' he said," Moore says. "He said, 'Mistakes are human.' And it was an insulting thing to say, because there he was in a position to make something off my ransom, and he's telling me that I made some sort of a mistake as if I had made a wrong move within Somalia, as if I'd done something to cross the gang. He was trying to make me feel guilty. But of course that echoed in my mind for the rest of my time, 'cause I made a very big mistake, you know? I not only went to Somalia — I got captured. And that weighed on me for the entire 2 1/2 years, obviously." Moore was freed in September 2014. The ransom was $1.6 million, which he calls a "filthy compromise." He spoke with NPR about the ordeal and his new book. They are not fundamentally terrorists. It's also a lie, though, that every pirate is a frustrated fisherman. That's a very convenient story for the pirates to put forward. The true part of it is that Somali piracy has its roots in illegal fishing, and illegal fishing is still a huge problem up and down Africa. But that's one point of the title of The Desert and the Sea, is that most of the pirates I met were not fishermen. And as it turns out — let's say, in a skiff full of six pirates, all six of those guys need to be gunmen. Only one needs to know how to run the outboard motor. So a pirate gang can get along with a whole lot of people who are not fishermen and have no experience on the water, and as a matter of fact, a lot of pirates can't even swim. The other thing though — the other important thing to say is that there would be no piracy in Somalia if enough kids had jobs. On his line "Hope is like heroin to a hostage, and it can be just as destructive"
Hope was a cycle, and after a while, it became a destructive cycle. People say, "Well, how did you hang onto hope for two years and eight months?" And the fact is: I didn't. I learned to live without hope. So having your hopes raised and then dashed every two weeks, which is what the guards tried to do — they would say, "Michael, don't worry, you're going to be out in two weeks, or a month" or something — was devastating. It was actually no way to live. And so I had to find a different level of existing. And it turns out you can live without hope. ... Any Hallmark-like quotes to the contrary are wrong. Well, hope and despair are just two ways of approaching the future. I don't know which philosopher I'm paraphrasing, I think maybe Sartre, but — those are just two mindsets toward an uncertain future. And if you would recognize that, and simply don't think forward toward the future, and don't insist on a rosy outlook for the next couple of weeks or months or years, then you can live in the moment. And that's what I had to learn to do. I would have snapped if I had done it any other way. The ship, in particular, because that's when I was with other hostages. I was held with one other hostage — Rolly, the fisherman from the Seychelles — for several months, both on and off the ship. I knew about 30 other guys who were hostage on the ship. This enormous crew became my friends, you know? We took care of each other. And when I was off the ship, I didn't have that company anymore, and in some sense, I was in solitary confinement for the rest of my captivity, which was almost two years. So that time in the ship, even though I was really terrified to go on it, turned out to be the best time in captivity. Oh, all the time. I mean, I don't dwell on it, but it's important not to just stuff it away. I think it's important to make sure that you realize it's still part of your life. While I was in Somalia, I thought of my life in Berlin and California, which is where I live now, as a totally different planet, you know. And now it's easy to think of Somalia as a different planet. But it's not, you know? So you have to live with both. Kat Lonsdorf and Emily Kopp produced and edited this interview for broadcast. Patrick Jarenwattananon adapted it for the Web. Michael Scott Moore is a journalist who traveled to Somalia to write a book about the history of piracy in the Horn of Africa. Things did not go the way he planned. The title of his new book tells you what happened. 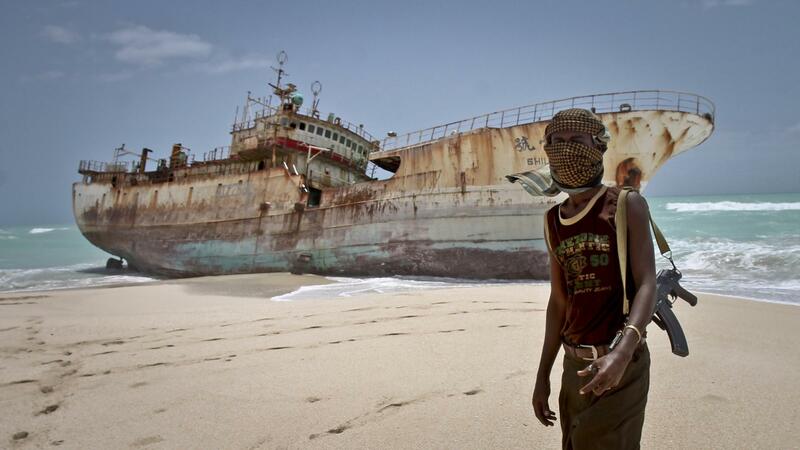 It's called "The Desert And The Sea: 977 Days Captive On The Somali Pirate Coast." His ordeal began just after Michael Scott Moore dropped off a colleague at a small airport in Somalia. And as he was heading back into town, his car came upon a flatbed truck full of armed men. MICHAEL SCOTT MOORE: The 12 or so gunmen on the back came off the flatbed and around to my side of the car and pulled me out. They bloodied me. They broke my glasses. They broke my wrist. And they piled me into another waiting SUV and drove me off into the Somali bush. SHAPIRO: That was day one. Over the next two years and eight months, Moore was kept in huts and on a hijacked tuna fishing boat full of other hostages. He got to know his captors. He made friends with other prisoners, and he kept turning over one line in his head, something a pirate said in the earliest days of his captivity. MOORE: You have made a mistake, he said. He said, mistakes are human. And it was an insulting thing to say because there he was in a position to make something off my ransom, and he is telling me that I made some sort of a mistake as if I had made a wrong move within Somalia, as if I had done something to cross the gang. He was trying to make me feel guilty. But, of course, that echoed in my mind for the rest of my time because I made a very big mistake, you know? I not only went to Somalia. I got captured, and that weighed on me for the entire 2 1/2 years obviously. SHAPIRO: Was going to Somalia the mistake? Was it something that you did when you were in Somalia? Not to place blame on you, but as you turned this over and over in your head, what was the conclusion? MOORE: Yeah (laughter) well, that's a good question. The longer I was there, obviously, the more sorry I was that I'd even gone to Somalia. No, the - going to Somalia in itself to research the book, no, it was not in itself a mistake. But after a few months of captivity, it was no longer worth it, you know? SHAPIRO: At various moments throughout your captivity, you are allowed to call your mother, usually to ask for ransom payments. SHAPIRO: And these are some of the most painful and also sometimes kind of comically absurd exchanges of the book. SHAPIRO: Will you read from one of these passages? MOORE: (Reading) He scrolled through the list of contacts on his phone and found my mother's number, pressed call and handed it to me. Her contact name on the screen was (foreign language spoken), mother of the infidel. Hello, said the infidel's mother. Mom, I said, the men here are threatening to sell me to Al-Shabab within three days if they don't get their money. OK, she said, playing it quite cool. Garfanji repeated his demand for a letter of absolution from the president. It must be signed by Obama, he said. It must have a White House seal. (Reading) How should she send it, I asked. She can send it by email, said the pirate boss. You could just mock something up in Word, I mumbled (laughter) into the phone. Oh, said my mother, who would have been coached on this question by the FBI. I don't know if we can do that, Michael, that would be forgery. Tell her the demand is still $20 million, Garfanji said. What is her counter offer? Mom answered, $8,000. Maybe we can go up to $10,000 (laughter). The difference between the two offers made me dizzy, but I felt proud of my mom. It was the only serious response. She says $10,000, I said. SHAPIRO: There are so many emotions in that one passage. SHAPIRO: I mean, as you read it, you're laughing, but also your mother is talking to her son who is being held by pirates in Somalia. You can imagine how she must be feeling. SHAPIRO: And the whole thing seems like such an absurdist farce. MOORE: It was, and it got worse. The whole ordeal was horrible on my mother, and the FBI agents that supported her said that she was just exceptionally good under pressure because it was obviously an emotional thing for her. I didn't think that she would be placed in that position, honestly. But that's how it worked out. SHAPIRO: Is she eager to read this book, or does she not want to relive it? MOORE: Yeah. She's read it, but it took her awhile. She said I can only read a few pages at a time. SHAPIRO: I've heard different narratives about pirates, that they're effectively terrorists or that they're just desperate poor people, that these people are fundamentally evil or fundamentally sympathetic. What's your view? MOORE: They are not fundamentally terrorists. It's also a lie, though, that every pirate is a frustrated fisherman. That's a very convenient story for the pirates to put forward. The true part of it is that Somali piracy has its roots in illegal fishing, and illegal fishing is still a huge problem up and down Africa. But that's one point of the title of "The Desert And The Sea" is that most of the pirates I met were not fishermen. And as it turns out, let's say in a skiff full of six pirates, all six of those guides need to be gunmen. Only one of them needs to know how to run the outboard motor. So a pirate gang can get along with a whole lot of people who are not fishermen and have no experience on the water. And as a matter of fact, a lot of pirates can't even swim. The other thing, though, the other important thing to say is that there would be no piracy in Somalia if enough kids had jobs. SHAPIRO: You were in captivity for so long. You at one point write hope is like heroin to a hostage, and it can be just as destructive. What do you mean by that? MOORE: Hope was a cycle, and after a while, it became a destructive cycle. People say, well, how did you hang on to hope for two years and eight months? And the fact is I didn't. I learned to live without hope. So having your hopes raised and then dashed every two weeks, which is what the guards tried to do - they would say, Michael, don't worry, you know, you're going to be out in two weeks or a month or something - was devastating. It was actually no way to live. And so I had to find a different level of existing. And it turns out you can live without hope. SHAPIRO: That's not something we ever really hear in our lives. There are so many quotes about a man cannot live without hope. You're saying you can live without hope. MOORE: I'm saying you absolutely can, yeah. Any Hallmark-like quotes to the contrary are wrong. MOORE: Well, hope and despair are just two ways of approaching the future. I don't know which philosopher I'm paraphrasing - I think maybe Sartre - but those are just two mindsets towards an uncertain future. And if you recognize that and simply don't think forward towards the future and don't insist on a rosy outlook for the next couple of weeks or months or years, then you can live in the moment. And that's what I had to learn to do. I would have snapped if I had done it any other way. SHAPIRO: This book's conclusion is also written into the title - "977 Days Captive." After nearly three years, Michael Scott Moore was freed in September of 2014. The ransom was $1.6 million. He calls it a filthy compromise. I asked Moore how often he thinks about the years he spent with the Somali pirates. MOORE: Oh, all the time. I mean, I don't dwell on it, but it's important not to just stuff it away. I think it's important to make sure that you realize it's still part of your life. While I was in Somalia, I thought of my life in Berlin and California, which is where I live now, as a totally different planet, you know. And now it's easy to think of Somalia as a different planet. But it's not, you know, so you have to live with both. SHAPIRO: Michael Scott Moore, thanks so much for talking with us. SHAPIRO: His book is "The Desert And The Sea: 977 Days Captive On The Somali Pirate Coast." Transcript provided by NPR, Copyright NPR.